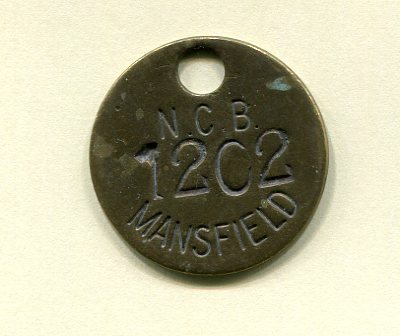 Brass ‘motties’ or ‘checks’ were used to identify miners whilst underground. If an incident occurred underground the motties would help to quickly identify which miners were in that area of the mine. An electronic swipe card system was later introduced, although many continued to use motties in the event of the system failing. Have you got a brass ‘mottie’ that you would like to donated to Mansfield Museum? We would like a mottie from Crown Farm, Warsop Main and Sherwood to go on permanent display in our new Made in Mansfield gallery. Please contact Jodie Henshaw at Mansfield Museum 01623 463088. I forgot to add, regarding pit checks and associated items of mining memorabilia, anyone who cares to visit the ladies and gentlemen of the “Friends of Pleasley Pit” at the aforementioned, former Pleasley colliery, which is now a very impressive visitor attraction and museum of the mining industry in this area.There are many quality artifacts and displays of items, machinery, equipment once in daily use by mineworkers both above and below ground. You will find displays of the brass checks and the latter swipe type cards which replaced them towards the end. For persons thinking of collecting mining memorabilia, a visit here would give any prospective collector of related items, much to interest and educate. These brass checks are the modern collectors item and semi recent “bygone” of modern times. When you think how many pits there used to be, how many men employed at each, plus so many checks issued as emergency ones, to allow a person(s) to be permitted below ground. Some were quite fancy, those of some antiquity are, others were no more than a piece of metal with a hole in, punched up by the fitter, or in the lamproom.They are easy to obtain, common ones are inexpensive, and they make a fascinating collection and an interesting insight into an industry which once dominated the local and national labour market in areas such as ours. My late father worked at Rufford Colliery and when he retired he used his brass “mottie” and an old farthing coin as a key ring. He carried them with him everywhere he went for the next 27 years. Sadly he passed away six years ago but I still use them as a key ring and every time I pick them up I think of him getting off the old pit bus at the end of our street and walking down to our house with his “snap tin” under his arm. The system may have worked differently at different pits. I worked at Rufford. We would have a very similar mottie or check to the one in the picture. This would be used when you went to pick up your wage packet, where you would show it as ID to get your money. Of course the person in the pay office knew who you were anyway, they new every one by their number mentally. This same mottie would also be handed in at the time office at the start of the shift in exchange for two more brass motties that had the same number as the one handed in, this number being unique as the employees pay number. A small square one and a larger octagonal shaped one. Upon getting onto the cage that took us underground, we would hand over the large octagonal mottie to the Banksman, the man who was in charge of seeing everyone safely onto the cage or “chair” as it was also known. This mottie was sent to the time office and recorded that, that particular person was indeed underground. After completing the shift underground we would hand over the smaller square mottie again to the banksman when getting off the cage at the surface, this also being returned to the time office. So in effect the time office could actually monitor when a person had gone underground and what time they came up. After leaving the cage we would walk to the time office, collect the original mottie handed in at the start of the shift, its at this point that the shift time ended. If we were late handing over the mottie at the start of the shift or early collecting it from the time office at the end of the shift, then our time could possibly be docked by half an hour or more, hence losing pay. As already mentioned by Jodie, latterly electronic time cards were introduced which used a barcode system where the swipe cards as they were known would be “swiped” by a scanner at various points on the surface, but these were plagued with problems, they were unreliable and were also very prone to dirt and damage underground which could make them unreadable. It was also felt by most that it was like being watched by “big brother” as the saying goes. I still have my brass mottie and my electronic card from 21 years ago. No more mining for me. I would think the motty in the picture is from Crown Farm colliery because the official name for Crown Farm was Mansfield Colliery.